Once upon a time, there was a relatively skinny kid from Glendale who was ripping up the local high school scene as a dominating running back, rushing for more than 2,100 yards as a senior. One of those weeks in the fall, the skinny kid from Apollo High School was invited to the Cardinals’ complex after winning the Wells Fargo high school player of the week award. 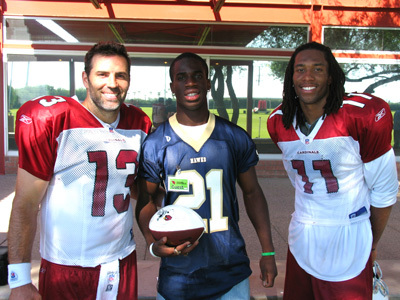 And Prince Amukamara came by to meet, among others, Kurt Warner and Larry Fitzgerald. (OK, it wasn’t too long ago. It was 2006). Amukamara has come a long way since then, going to the University of Nebraska, getting switched to cornerback and, obviously, filling out physically. Now he’s a first-round NFL draft pick-to-be, impressing a lot of people at the just-completed Scouting combine. He’s regarded as the second-best cornerback behind LSU’s Patrick Peterson. This story is awesome. Thanks Darren. ha man that’s an awesome before and after! amazing how much 5 years and weight training can do. Hey Darren would he like to play for the Cardinals. By the way whats his favorite NFL team. No idea on either question. If Miller, Quinn, and Peterson are gone at 5 . . maybe we can roll the dice and move down to 8 or 10 and grab Prince plus the gravy from TEN or WAS? Darren I asked you about a month or 2 ago about this guys draft status and if you thought the Cards would have interest in a Corner like him, and you told me you had never even heard of him before? I hadn’t. I remember the tweets. This pic isn’t mine. We watched Prince play at Apollo and he is truly a gifted athlete. Sad to say neither ASU or UofA gave him a look (big surprise). So one of our own went to Nebraska and showed what we missed out on locally. I hope he continues to do well whatever path he chooses. Darren,this has nothing to do with this article BUT I was wondering if the lock out does happen,do players still have to do drugs tests?? My guess is no, since that is a CBA issue. Hey can we bring an Arizonan home as a Cardinal? All things being equal, I think pass rusher is a more pressing need. With AJ Hawk available do you think the Cards will try and sign him? Seems as if Porter and Hayes are on their way out. That would free up a lot of the money that would be required to get him. He would still give the team a veteran presence and he’s still young enough to have a lot of productive years left. 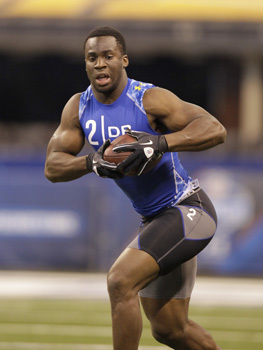 Combine him with Von Miller, Schofield and Washington……things would be looking good. Then sign Bulger or Alex Smith. Heard anything about compensatory draft picks for the Cards in 2011? Most indications are that the Packers and Hawk are working on a new deal. Darren what are the chances of the Cardinals picking up AJ Hawk? Wow, five years sure did a lot for him. His difference in size is enormous. Yeah thats a good answer, a pass rusher is a good need, it just seems like the guy accross DRC has been picked on the last 2 seasons, I like Toler a lot, but seems like we need some insurance behind him, and mcfadden made me sick last year i was really looking forward to him in 09! do you see the cards pursuing A. J. Hawk? Darren, if Miller is off the board at 5 I would like to draft Peterson because i think he is just one of those superior play-making athletes that could really benefit our team. Besides I don’t see us drafting Quinn if he is there because we have Campbell already who didn’t have a good as year as many expected but I figure should bounce back. What are your thoughts on Peterson if Miller is gone or is there someone else you think the Cards should draft? He looks like a very good talent. The pool, I’d think drafting at 5, is going to be small in terms of who they look at. There can only be four guys picked ahead of them, so the Cards will have a lot of choices. lets say the a new deal is done, what are the odds we go after palmer ? from the sounds of it he’s going to be another Q.B looking for a place to start. How does anyone know whether it’s “in place,” the Rams didn’t know but they were confident in their “Guy.” The Cardinals were not! They not only dumped their “Guy” last year, but also winged it the rest of the season. Showing confidence in a player(5th round QB) is important, but when that confidence was instead placed in a non-drafted QB the TEAM had problems. I sure hope the Cardinals don’t pick Cam Newton for his “charisma.” And, I was hoping we were going to stray from “The QB Guy” talk this year since Ken W. has basically jinxed any possible “QB Guy” because of what happened to him(M. Leinart) last year. Take Ricki Stanzi(Iowa) before Blain Gabbert, he beat the Missouri QB in the Insight Bowl this year with an “undermanned” team and after coming back from a late season ankle injury. But only if no other option is available. Although Stanzi didn’t do very well during the combine, he did better than Gabbert who opted out of throwing. Stanzi is a gamer! Forget Ponder, we have Max Hall who is almost a Ponder look alike. The Cardinals and Ken W. ought not try catering to Fitz(TRADE HIM), the team would’ve been better off running more last year and nothing is likely to change this year. I wish the Cardinals were as up front about its offensive problems as the Cincinnati Bengals. Maybe we could trade down for Prince or Quinn and get an extra 2nd rounder that we could use for an OLB, or CB either way it’s good seems they’re not to far off from Miller and Peterson and the cards get an extra pick or picks. Patrick may be too good to pass up and I think he is especially since we have a huge hole at cb outside of DRC. Prince is a great player too though. Von is very nice too at 5, it is so hard because I like Cam too. Patrick also has great return ability, he and larod on kickoffs ain’t fair smh and he would be a very impactful pr ala dez bryant in his rookie year. The game against Justin Blackmon doesn’t concern me as much as how many passes got thrown his way. For a guy with a first round grade teams really didn’t hesitate to test him, and usually with pretty good results. Obviously, the OSU game was the worst but the Big 12 title game was eye opening as well. He does a lot of things well but he really doesn’t look like a shut down corner to me, which is what I think would be expected from an early first round pick. 3) Follow the Bengals model of management? Sounds like a concrete plan for the #1 pick in 2012; personally, I’d rather see us put ourselves back on top of the NFC West. That was one game and you don’t know if the safety messed up on certain plays where he got ”beat”, that doesn’t worry me about him wherever he goes, prince is a phenomenal player and blackmon is probably going top 10, maybe top 5 next year.